The annual Fall School on “Terrestrial Modeling and High-Performance Scientific Computing” is enjoying strong international demand. In 2017, 46% of participants came from European neighbouring countries, South America, Asia or Africa. I share the office with my colleague Kris van Looy, who coordinates the ISMC – a global network in the modeling of soil processes. We both know about the importance of international cooperation; it is obvious that we also develop joint projects. In December 2016, I participated in the 9th Forum Science Communication (Forum Wissenschaftskommunikation, Bielefeld, Germany) at the session “It takes two to tango – International Research Marketing and University Public Relation”. “With good ideas around the world,” the subheading for the presentation of the winning concepts sounded promising somehow. Therefore, I already knew the idea competition of the DFG when the 2017 call for proposals arrived in the e-mail inbox. Why am I telling this all? Well, basically, all of these factors were important in submitting our competition concept! The Pan-African Soil Challenge, which was submitted as part of the Ideas Competition International Research Marketing, is ultimately a joint application of Geoverbund ABC/J, the International Soil Modeling Consortium (ISMC) and the Centre for High-Performance Scientific Computing in Terrestrial Systems (HPSC TerrSys). All three organizations are based at the Jülich Agrosphere Institute (IBG-3). Not yet tired of abbreviations, we considered PASCAL as a good acronym for “The Pan-African Soil Challenge”. Apart from purely science-driven projects, the DFG Ideas Competition offers an ideal opportunity to promote the expertise and know-how of both networks and HPSC TerrSys beyond the existing scientific communities, to combine different assignments and concerns, and to try something completely new to us! Kris and I had set up the idea sketch within minutes. The elaboration of the complete concept then took place through personal meetings with colleagues from Jülich’s corporate development and human resources development; in the area of actual marketing, we were able to rely entirely on the experience and ideas of Jülich’s corporate communications. In addition to this blog, for example, contributions will appear in the Jülich research magazine “effzett” and a scholarship for an African journalist will be awarded. PASCAL now combines something well-tried with something new. The “Terrestrial Modeling” training is based on the Fall School concept of the HPSC TerrSys. It offers participants the opportunity to perform terrestrial simulations in a supercomputer environment. The hackathon (word creation from “hack” and “marathon”) builds on thematically and focuses on the joint development of software by the participants. Hackathons are becoming increasingly popular; for the geosciences, the format can be considered as particularly innovative. With developments in high-performance computing (HPC) and big data at a rapid pace, there is a growing need for well-trained scientists who can handle complex HPC systems and their analysis results. The PASCAL participants should pass on what they have learned and function as knowledge multipliers. PASCAL is intended to initiate a “Science Bridge” between Forschungszentrum Jülich and various African partners. This should help to increase the long-term visibility of Germany as an outstanding research location. So far so good! Why now Africa? Today, 17% of the world’s population lives on the African continent. According to an estimate of the UN, it will be 40% in the year 2100. In view of both the predicted population explosion and climate change, a safe and sustainable food production for Africa belongs to the global and societal challenges. HPC technologies, e.g. 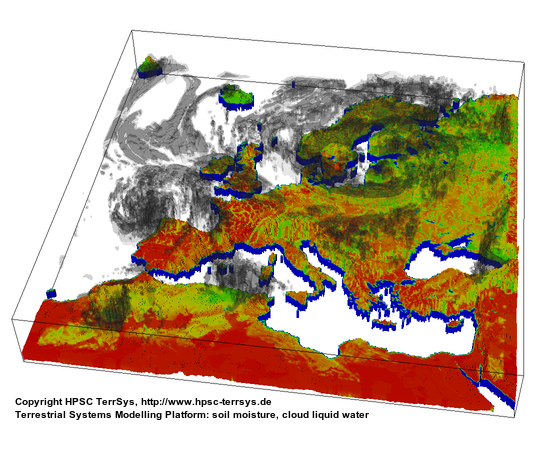 used for hydrological and atmospheric simulations within terrestrial systems can help to overcome these challenges and provide much-needed answers to questions. Europe has a special responsibility for Africa because of its direct neighborhood. For the practical implementation of the concept, PASCAL can finally fall back on experiences from cooperation with African partners, such as The West African Service Center on Climate Change and Adapted Land Use (WASCAL).